Delenn's future love interest, Captain John Sheridan (Bruce Boxleitner) arrived on Babylon 5 in the first episode of season 2, "Points of Departure." The show marked the handing over of command of B5 to Sheridan from Commander Jeffery Sinclair, actor Michael O'Hare becoming a victim of studio politicians who wanted a bigger star in the leading role. This excellent installment also revealed more about why the Minbari surrendered to Earth at the Battle of the Line when they were on the verge of victory. "Revelations" explains that Sheridan's wife, Anna, died during an archaeological survey of the world Z'ha'dum, the name being just one of many references to Tolkien's the Lord of the Rings (the bridge at Khazad-Dum). 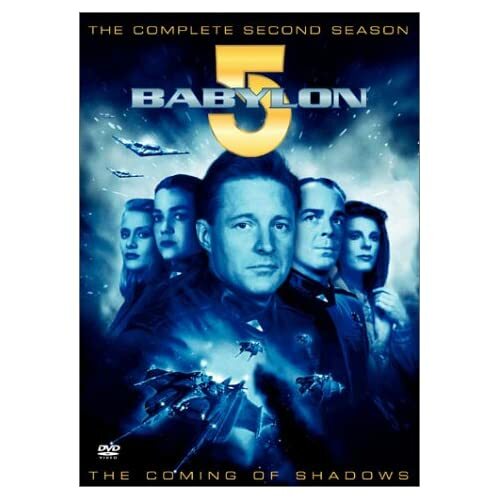 "The Geometry of Shadows" introduced the Technomages, characters who featured more significantly in the ill-fated spinoff series Crusade (1999), while "The Coming of Shadows" proved to be Babylon 5's finest hour to date. The story of political intrigue foreshadowing the fate of two of the major characters beat Apollo 13, Toy Story, 12 Monkeys, and Star Trek: Deep Space Nine episode "The Visitor" to win the Hugo award for Best Dramatic Presentation at the 1996 World Science Fiction Convention and proved so powerful that J. Michael Straczynski included it in his Complete Book of Scriptwriting. "And Now for a Word" took the unusual step of presenting a day-in-the-life of B5 seen through the eyes of a TV news crew, just as the Narn declared war on the Centauri. The inclusion of a PSI-Corps commercial paid homage to Paul Verhoeven's satirical ads in Robocop (1987), while his later Starship Troopers (1997) seemed at times like a spoof of B5's earnest space opera. In "In the Shadow of Z'ha'dum," Sheridan learns that Morden was on the ship on which Anna died; the episode sees the captain pushed to his limits by grief and determination to discover why Morden survived. Three exceptional shows conclude the season. The Narn-Centauri war escalates in "The Long, Twilight Struggle," Sheridan faces a most unusual ordeal in "Comes the Inquisitor," and in "The Fall of Night" all hope of peace is shattered as a nerve-racking assassination attempt reveals a startling secret about Ambassador Kosh.